The Campbellsville University Piano Ensemble will give its spring concert Thursday, April 8 at 8 p.m. in The Gheens Recital Hall of the Gosser Fine Arts Center at 210 University Drive. Now entering its third year, the piano ensemble has already gained recognition for its performances, according to Dr. Wesley Roberts, professor of music. It was the winner of both the 2008 and 2009 KMTA Bluegrass Young Artists Piano Ensemble Competitions. Taylor Regional Hospital will present a "Violence in the Workplace" class on Thursday, April 8 from 8 to 10 a.m. The course is an overview of responses to potentially violent situations in a work setting, how to recognize a possibly dangerous situation and how to formulate a plan to defuse a violent action. All classes are in the TRH Learning & Resource Center at 125B Kingswood Drive in Campbellsville and cost $10 for non-TRH team members. Richard Phillips, staff development coordinator, is the class presenter. Taylor County’s Lady Cardinals won their first two games in the Florida Beach Bash to improve their overall softball record to 8-0. Chelsea Nicholas went 3-4 with three doubles, scored two runs and had three RBI while Karrie Cave went 2-2 with a single, a double, an RBI and two walks as coach Kelly Townsend’s club beat 13th-rated Assumption 10-3 on Monday. Bethany Skaggs picked up the win, scattering nine hits while striking out four. Taylor County edged Lone Oak 7-6 in eight innings on Tuesday. Campbellsville University will host a job/career fair Wednesday, April 7 from 2 to 4 p.m. in the Student Activities Center. More than 35 employers with full-time, part-time and internship opportunities will attend. The job/career fair is offered as a service to our graduating seniors, but is open to all students, CU alumni and the community. Teresa Elmore, director of career services at Campbellsville University, said the job/career fair is an event open to networking and internship opportunities for all. She said entrance requires professional/appropriate dress. Campbellsville High dropped its third baseball game in five decisions with a 9-4 setback at Southwestern on Tuesday. The Eagles led 2-1 until the Warriors tallied three runs in the third and five more in the fourth. Taylor Levi and Mason Wethington had two hits apiece for the Eagles with Levi scoring two runs and driving in one. Levi Murray doubled in a run in for CHS while Ben Janes and Aaron Schwoebel collected singles. Campbellsville’s Lady Eagle softball team fell for the fourth time in as many tries this season but went the distance in a 10-1 home loss to Metcalfe County on Thursday night. The Lady Eagles (0-4), who had lost at Green County 14-0 in five innings, to Bethlehem 13-2 in six innings and 13-3 at Hart County in five innings, gave up several unearned runs and trailed the visiting Lady Hornets 10-1 after 2 1/2 innings. It was the Eighth Annual Spring 30 for the Good Neighbor Pharmacy Super Late Models at Ponderosa Speedway, and Justin Rattliff of Campbellsville drove to the 30-lap, $1,500 payday. Also in action was the American Modified Series presented by Force for Earth Fuel, and Randle Sweeney of Clifty won the 30-lap, $1,500-to-win Arizona Sport Shirts 30 presented by Force Fuel and Engine Conditioner. 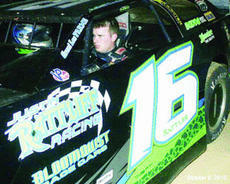 The Bob Allen Motor Mall Pro Late Models was captured by Jeremy Hines of Williams, Ind. in the 20-lap, $800-to-win main event. Taylor County High School’s baseball team defeated Washington County 5-1 on Wednesday before dropping a 6-5 road decision to Cumberland County on Thursday. Matthew Johns pitched a complete-game five hitter at Washington County with no walks and seven strike-outs. Levi Smith had a home run and two RBI while Logan Tucker also knocked in a pair of runs. The Cardinals led 5-4 going to the bottom of the sixth inning at Cumberland County, but the home squad tallied the tying and go-ahead runs to take the lead for good as TCHS went 1-2-3 in the seventh. Campbellsville native Logan Smith hit .545 for Campbellsville University last week to be named the Mid-South Conference Player of the Week in an announcement on Monday. Smith, a senior designated hitter/catcher, hit a pair of home runs and had 10 RBI during the Tigers’ six-game win streak. He began the week by nearly hitting for the cycle and reaching base in four of his five plate appearances in a 13-7 win over No. 23 Taylor (Ind.) University last Monday. Campbellsville University's WLCU TV-4 will air a "Dialogue on Public Issues" show this week with Dr. James Leo Garrett Jr., distinguished professor of Theology Emeritus at Southwestern Baptist Theological Seminary. Interviewing Garrett is John Chowning, vice president for church and external relations and executive assistant to the president. The show will air on WLCU TV-4, Comcast Cable Channel 10, on Wednesday, April 7 at 1:30 and 7 p.m.